After five novels with twin plots (present and historical), I’m currently working on my very first novel set entirely in the past. 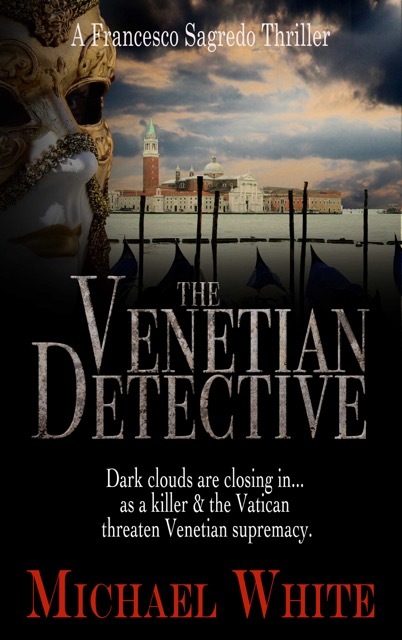 The novel is provisionally titled The Venetian Detective. It is set in my favourite place in the world, Venice, and the period in history I find most fascinating, the late 16th century. But why do I feel so drawn to this city and this time? Venice is like no other place on earth. If you haven’t been there I urge you to go. It’s like a theme park that puts in the shade all the modern ‘dream worlds’ such as Disneyland or Universal Studios. Plus it’s authentic because it’s the real deal. There can be no more exciting location for an author than Venice. It is bursting with history, mystery and strange tales. It is a place where fantasy meets reality; a mental crossroads, just as it was formerly a hub for almost all trade in the Renaissance world. You can see it in the architecture and the paintings, and feel it in the atmosphere. Venice is a geographical and psychological melting pot; east meets west, mind meets body and spirit meets flesh. Beyond even these factors, Venice is an ‘emotion amplifier’. What do I mean by that? It is a place that will exaggerate whatever you are feeling. If your life is going perfectly and you are deliriously happy it will make you happier; if you are feeling low, the dark side of Venice will drag you down into the Lagoon. Venice is a drug that will alter your state of mind, it will scar you and it will reincarnate you. It is darkness and it is light. It is good and it is evil. And so why the Renaissance? Well, what is not to love about this period if you are attempting to create worlds, universes and phantoms? Until the 20th century with its innovation and technology, from Sputnik to Dolly the sheep, the Renaissance marked the period in the history of civilisation that offered the most rapid and dramatic steps forward in recorded history. And for the novelist, movement is imperative. From times of change, strange stories may be wrought. So, the dream team – combine Venice and the Renaissance – and you have a magic blend. A place that no longer changes, but a location that was at the centre of progress and movement during the 16th century. Venice (along with Florence, Rome and maybe Paris) was where the modern era really awoke from the ferment of earlier times. During the late 16th century Galileo was frequently in Venice (and teaching in close by Padua), Giordano Bruno was jailed there, Gianvincenzo Pinelli had a spectacular palazzo on the Grand Canal. Venetian native, Titian painted his home like no other and died from the terrible plague of 1576. During the Renaissance, the Most Serene Republic, as it was known, was still a powerful military and economic force. Venetians were the Kings of the World. So now I realise that by writing about this place and this time, I have trapped myself! I have no excuse for delivering anything that is less than wonderful!